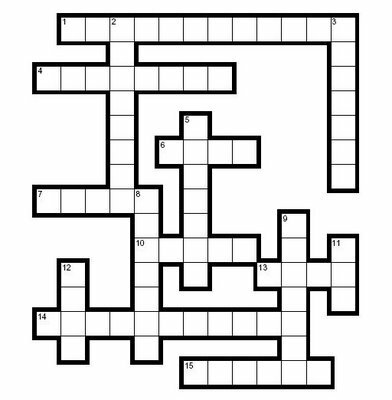 I was thinking of coming up with crossword puzzles on my blog once in awhile. So for the first time, I'm putting up a crossword puzzle based on The Amazing Race theme here. For this first puzzle, I'm going to put up something simple, easy clues but definitely not for those who never watch the earlier seasons. *please come back again if you are not able to download because there is limitation for downloading per day. 1. New twist in TAR Season 10. 4. Two teams from this country participated in TARA. 7. Team Joe & Bill (life partners) from the TAR Season 1 is also known as team ___. 10. New element in TAR Season 5. Time matters. 13. How many participants from TARA are not Asians? 14. In TAR Season 3, participants received their clues from this popular actor in Singapore. 15. "Romber" team finished ___ in TAR Season 7. 2. Which South East Asian country did the participants race to in TAR Season 2? 5. B.J. & Tyler (winner of TAR Season 9) are also known as The ___. 8. ___ themed challenges - track and field, swimming, water polo, archery. Athens 2004. 9. ___ & Chip (winner TAR Season 4). Long-term relationship with Lance Bass (N Sync). 11. TARA Season 1 has ___ participating teams. 12. ___ hours penalty - "Who Digs the Beach? ".